I had planned to use this article to jump right in to the next stage our building process and an explanation of the Focus on Energy Program, but…I think it’s better to perhaps “begin at the beginning”. I never would have believed that when we set out to find a piece of country property that it would be so tough. Every direction we drove (and believe me, we drove all around the Green Bay area), farmland is being gobbled up with “exclusive” subdivisions. What this appears to mean to me is that you take a 40 acre parcel of farmland, divide into 5 acre parcels which sell for $50,000 and up (way up). On these parcels you then build houses with prices in excess of $300,000. The balance of the property is turned into a small golf course. By the way, don’t even think about animals (other than the occasional horse). These are country “estates”, not hobby farms, and are protected as such by zoning ordinances and restrictive covenants. Back in February 2004 when sold our house on Buckeye, we put an offer in on 15 acres FSBO about 15 minutes out of Green Bay. 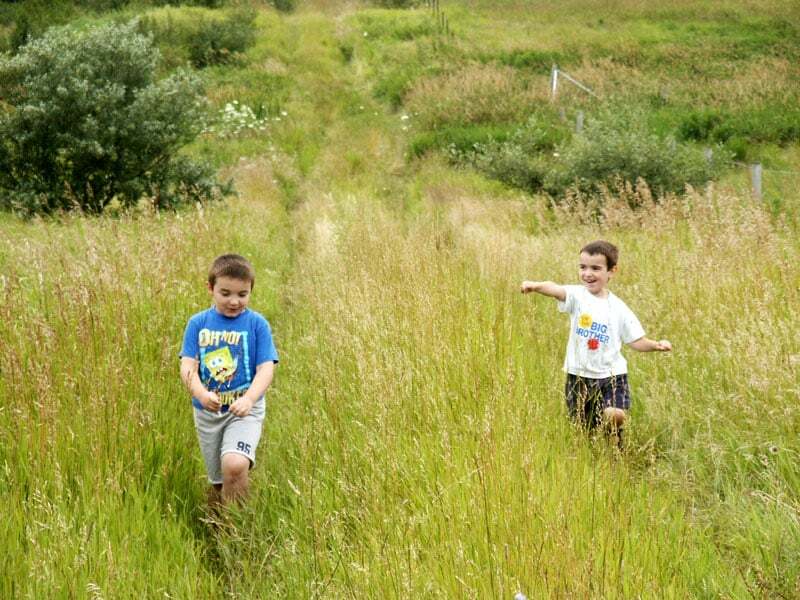 The acreage in question was surrounded by smaller parcels (many of them around five acres) and the property owner had been told by a town board member that the parcel could be built on. Five months we have waited, and the town board in question has not allowed the parcel to be built on. It appears that there are some conflict of interest issues and it is unknown when the situation may be resolved. It has been an amazingly frustrating period of time. We finally moved on to another piece of property. We now have an accepted offer on a 35.2 acre parcel in Kewaunee County. Do we really need that much acreage for what we are planning? No. However, it is in our price range, the zoning is correct (agricultural) and the land is rolling with several potentially build-able south facing slopes. 25 acres of the land is currently rented to a nearby dairy farmer, and we hope to maintain the majority of the property as farmland. We received a very nice letter from the town clerk explaining their zoning ordinance. It confirmed that we could build on the property and expressed their hope that we would preserve the farmland (country estates are not encouraged), which is what we want to do. Given the pleasant tone of the letter, we are optimistic that this town board will be easier to work with than the last. The house and outbuildings will be placed to minimize impact on the farmland – along an edge rather than dropped in the middle of a field. The land is gently rolling, so a walk-out ranch style house should be easy to site. The soil appears to be a sandy loam (possibly more sand than loam), which will be an interesting change from the heavy clay I have worked with for the last nine years. The land itself is beautiful, but we still have some concerns about the distance from town. As our boys get older there will likely be more activities and more time on the road and August’s daily commute is about 30 minutes one way. This may sound silly to a lot of people I know who drive significantly farther, but it will be a change for us. We’re looking at a Toyota Prius as a commuting vehicle when August’s current car dies. We are still fine tuning the house plans with our builder Bart Rynish of Barton Designs. Certain things will fall into place based on the location we build on, and other things will be resolved as cost estimates come in. One major change we have made is to move a second bedroom back onto the main floor. We finally decided that if the situation should arise where we would be providing in-home care to an aging relative, it would be easier to do this if we were on the same floor. We have placed a larger, Universally Accessible bathroom between the two bedrooms, and are watching to make sure that doorways and other areas allow wheelchair clearance. This has been somewhat challenging, since we are trying at the same time to keep the square footage down. Most material I’ve read on designing small houses incorporates design features like very tight stairwells and minimal clearance areas. This is great if you’re mobile and have a small build, but much of the population doesn’t fit one or the other of those criteria at this point. As I mentioned in the last article, Bart is a Wisconsin Energy Star certified builder. There are around 60 Energy Star Certified builders in the area, so most people should be able to find one who fits their building needs. 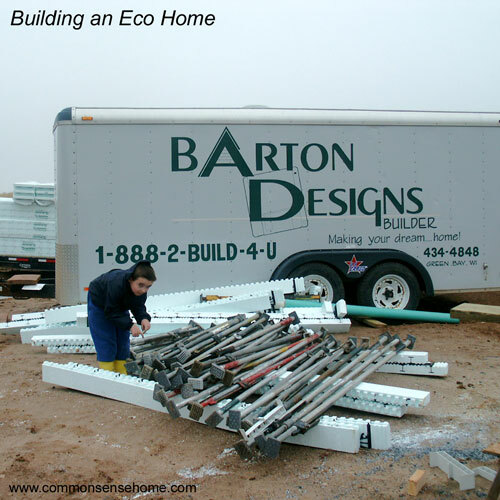 We chose Bart primarily because of his experience with SIP (Structural Insulated Panels) and ICF (Insulated Concrete Form) construction and because of his Green Built certification. Energy Star builders undergo a training program to bring them up to date with the latest information on building energy efficient homes. To be certified as an Energy Star home, a house must be checked by an Energy Star consultant during construction and at completion. To qualify for some Energy Star rebates, your home must be Energy Star certified. This means that if you use an Energy Star builder but your home does not pass certification, some rebates will not be available to you. The good news is that with an experienced Energy Star builder, the majority of their homes pass with flying colors. Do your homework and ask around. In addition to whole house certification, the Energy Star program also certifies appliances, both for heating and cooling and general household use. At times they also offer cash-back rewards for certified appliances, but there are none currently posted (www.focusonenergy.com). (There were some earlier this year, so it pays to check back before you make a purchase.) They also offer cash-back rewards and low interest loans (although not both for the same system) for qualifying solar water heating, solar electric and wind power systems. Please note that the system must be approved before it is installed to qualify for the rebate. The Renewable Energy Workshop Scholarships program provides $50 scholarships to qualified individuals so they can attend educational workshops provided by the Midwest Renewable Energy Association (www.the-mrea.org). MREA offers a lot of interesting programs during the course of the year, along with their annual energy fair during summer solstice. All Wisconsin utilities now operate their residential renewable energy programs through Focus on Energy. Basically, if you’re thinking about building a home, buying a new appliance, installing a renewable energy system or just learning more about renewables, it pays to check out the Focus on Energy information. Next issue I’ll talk more about our heating and cooling choices and everyone’s favorite subject – sewage! (Or greywater and potential fertilizer, as I prefer to think of it. The DNR is not so enthusiastic.) With a little luck, we’ll have broken ground by that time and will be on our way to building our eco-home. Don't forget about our Common Sense Homestead Open House, October 6, 2012 from noon until 4pm. The boys checking out their new stomping grounds.